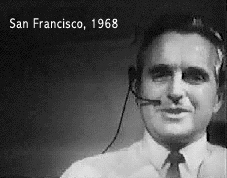 December 9th, 2013 marked the 45th anniversary of the Mother of All Demos with a wonderful memorial celebration of Doug Engelbart, who passed away earlier that year. With SRI International and Logitech, Inc.
New tribute site honoring Doug Engelbart – share how you were touched, browse photo gallery, tribute videos, and more. To learn more about the demo or watch footage of the demo, visit Doug’s 1968 Demo at the Doug Engelbart Institute.